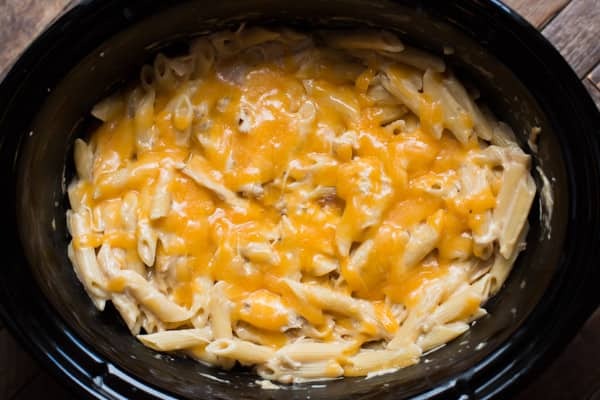 Make this Slow Cooker Cheesy Chicken Penne for dinner and everyone will want seconds! 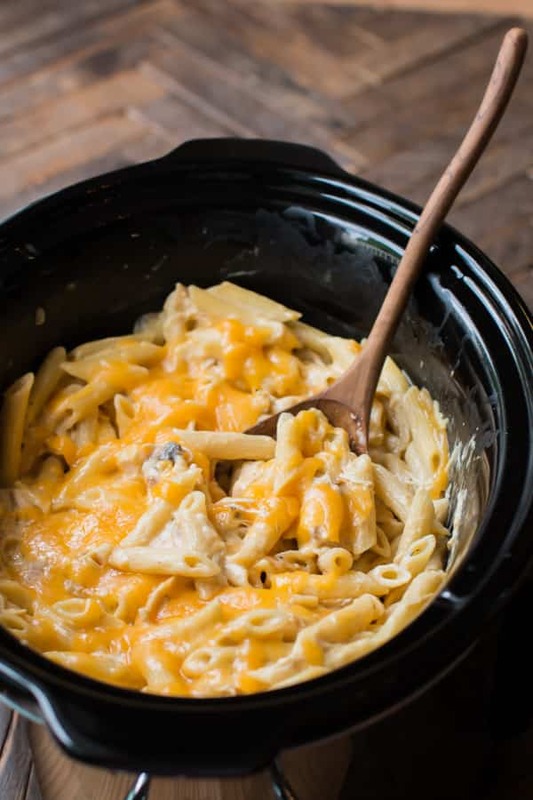 I was on pinterest and saw this recipe and knew I could make something just as good in my slow cooker. 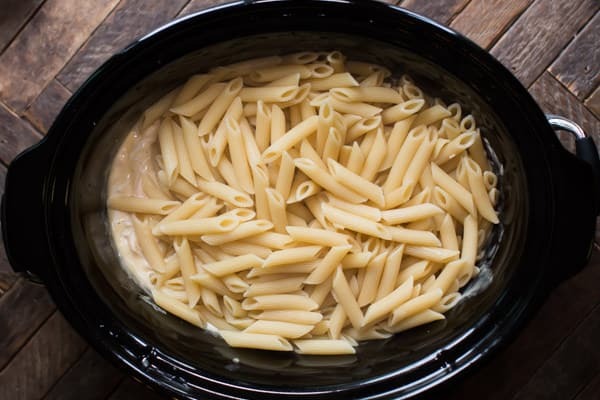 I didn’t realize I was going to make the easiest most delicious and kid friendly pasta ever! I made this recipe again a week later for a girl scout pot luck and there wasn’t any left! I start by cooking 2 cans of cream of chicken soup, chicken breasts, chicken broth, dried tarragon and pepper for 6 hours on low. Then I shred the chicken and add sour cream and cheese. Then add the cooked penne pasta. I originally planned to make this with egg noodles, I bought an off brand and those fell to bits right before I was going to add to the chicken and sauce. I went back to the store and bought penne pasta and I am so glad that I did. 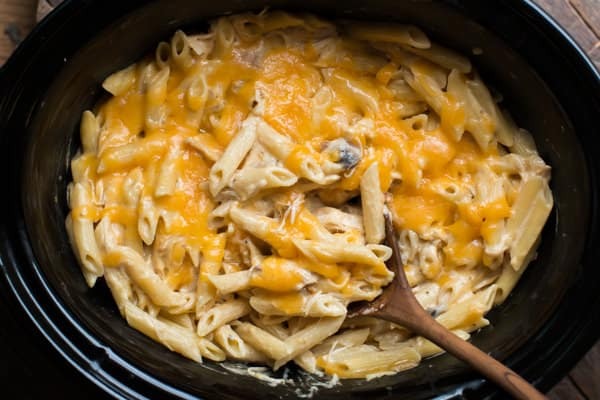 The penne pasta has a great texture, perfect for this recipe. Heaven on a plate! Plenty of sauce to coat all the noodles. I highly recommend this meal for an easy weeknight meal. Would your family enjoy this pasta dinner? Mine really did! I hope you have a great weekend and I’ll be back next week with another recipe. Add the cream of chicken soup and chicken broth to the slow cooker, stir until smooth. Add the tarragon, pepper, mushrooms and onions, stir. Cover the slow cooker and cook on LOW for 6 hours without opening the lid during the cooking time. After the cooking time is up, start cooking the pasta according to the package directions to Al dente on the stove-top, do not over cook! Add sour cream and half of the cheese, stir. Add the cooked and drained pasta and stir again. Sprinkle over remaining cheese. Cover the slow cooker and cook for an additional 20 minutes on low. If you have extra picky eaters and want to omit the mushrooms and onions add an additional ½ cup of broth. This will replace the moisture from the mushrooms and onions. 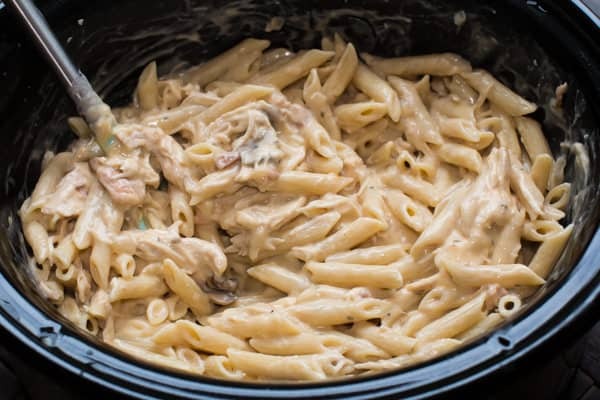 I used my 6.5-quart touch-screen Crock-Pot® for this recipe. 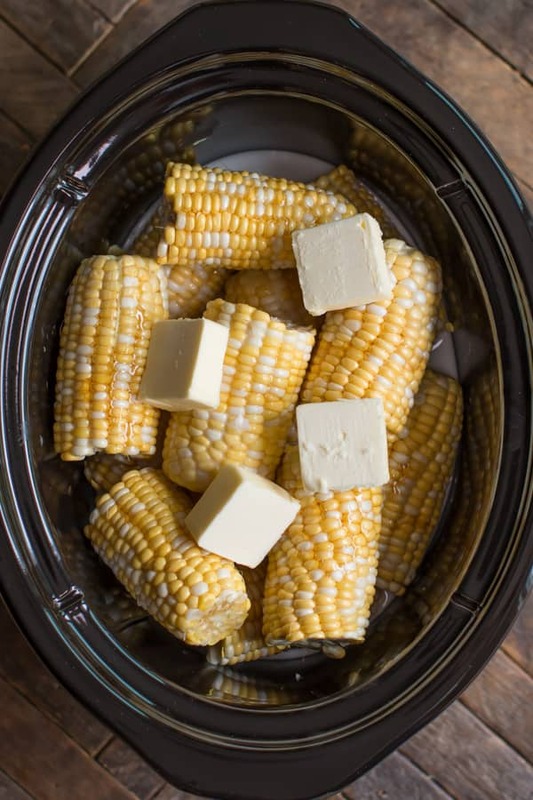 You can use any slow cooker 5-quarts or larger. how many servings do you think you get from this. Sarah I’m in Australia where would I buy a sweet yellow onion never heard of them? If you can’t find a sweeet onion, often called Vidalla, you can use a white or yellow onion instead. how much would I need if I was making this for about 12 people? If it’s a main course I’d do two crock pots. If it’s for a potluck, it should be plenty. Candace McCracken all you need to do is double the recipe. In one crock pot? Right. Looks yummy! My question is, do you think shredded Pork Tenderloin would tast okay as a meat substitute? I have some in the fridge, already cooked and shredded! Tried this but it tasted kind of bland. Needs more flavoring. May try again but spicier. This recipe does not call for any salt. May account for the blandness. It has a ton of salt from the soup, it was not bland to me or my family. You can always add more for sure though! This was good and very easy to put together. It just seems like it was missing something…a little more flavor is needed. Made it and loved it!!!! I will be making again soon!! Thank you!! My husband and kids dont do sour cream. If i cut the sour cream in half, do i need to add more soup or broth to compensate? Or can i substitute something else for the sour cream entirely? Would love to try the recipe out! Maybe a touch of heavy cream Lynn? Maybe substitute plain yogurt for the sour cream. Add cream cheese instead of sour cream if sour cream isn’t a favorite. Can this be frozen as I would do this for my daughter and i.
I made this for dinner tonight and we love it. This is definitely a weekly meal for us now. I feel the same way about this meal, not something I would get tired of eating. Tried this today but didn’t have the cream of chicken so I replaced it with sour cream and added some cumin for more flavor also added red bell peppers since we love them in everything, really enjoyed it. Thank you for letting me know how it turned out, extra sour cream sounds delicious. If you cut the recipe in half, would the cook time still remain the same? I would do 5 hours on low if I was to cut this in half. Thawed 🙂 All my recipes use thawed meat. It should but fine, keep the lid on and cook for about an extra half hour. The Cheezy Chicken Penne was very good. I added a third can of soup and it made it creamier. I will definately make this again. Awesome! Can’t have too much sauce in my book. Any ideas for reheating if u have lots of left overs and want to have for a second nights dinner? can we cut time in half if we cook on high? This meal was wonderful, my husband ate three helpings. It will be a regular meal in our home. Thank you for sharing this recipe. I wouldn’t do any less time on high than 3.5 hours. 3 doesn’t seem long enough to cook the chicken properly. Could you do a can of cream of mushroom instead of the mushrooms and onion to still get that flavor and not lose the moisture? I have the same question as Jane. Can this dish be frozen?? I am unsure Kathy, I have not tried. Pretty good sized, but if normally 1 pound of pasta is not big enough for your family, then I don’t think this will be enough. Do you think cream cheese could be substituted for the sour cream? I made this and added corn and also rotel, let it sit on warm over night. It’s super yummy! It says 8 servings, how much is a serving? It’s approximate. It will feed about 8 people, divide evenly. Sounds yummy. Was just wondering what to do with the half a kilo of chicken breasts I defrosted yesterday! Instead of canned soup can one make and use the powdered packet soup instead? Hi Maheerah. We don’t have powdered soup packets here, I’m unsure how it would turn out. If I have a small crock pot should I cut the recipe half? Does everything remain the same? I think so, and the time should stay the same too. So excited to make this for my family tonight!!! Thinking of adding bacon to mine instead of mushrooms!! Thank you for sharing Sarah! 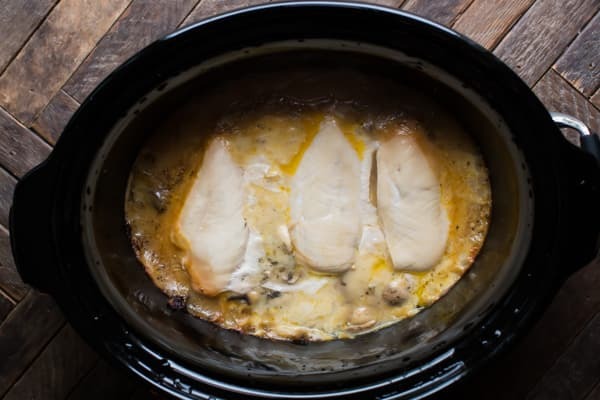 Season chicken before you place it in crockpot (finished product taste better). I have cooked this four times and didn’t season chicken the first time. Use cream of mushroom soup; no mushrooms or onions. My daughter and I love this recipe!!!!! 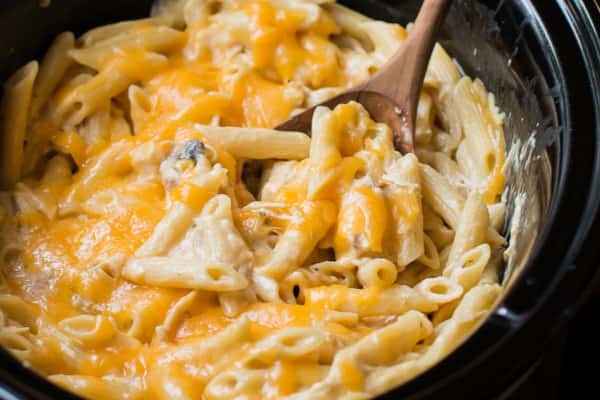 Could Velveeta cheese be used in place of shredded cheddar cheese? I have no chicken broth. I used veg. broth to make your cream of recipe and also veg. broth in the recipe itself. Smells so good! Will try to post whether it works out or not. Great! I can’t wait to hear! I don’t recommend uncooked pasta in the slow cooker, it tastes like chalk, though it can be done. I don’t know how much water. Can you use egg noodles instead of penne pasta? Any ideas for reheating if you have lots of left overs and want to have for a second night dinner? I microwave individually on each plate! Sorry I haven’t tried any other way. Can you use different cheeses? I am hoping to maybe try a mixture of Italian style cheeses instead. Would that still taste good? 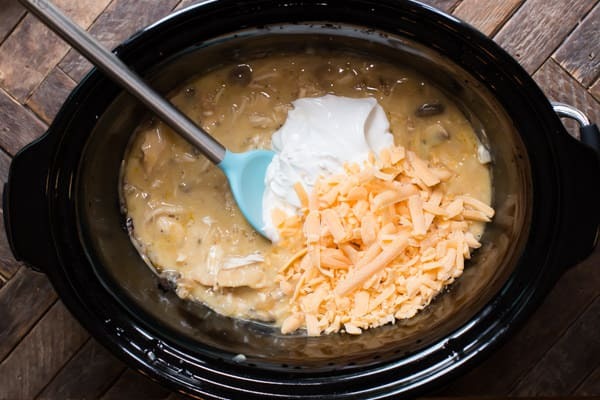 What if you only have a 4 qt crockpot? Should I cut the recipe in half? I think you may have to get this to fit. It was delicious! My family enjoyed it. I didnt add mushrooms but it was good without it. The chicken was tender and the flavor was good. I added italian seasoning and poultry seasoning and it gave it a good flavor. It’s def going in my recipes list. Thank you for sharing this recipe. Can use rotisserie chicken and just reduce cooking time? Would you also reduce other ingredients? How many cups is considered a serving? 1 cup? I don’t think it will burn! Should be fine. Buy a timer you can set & plug the crock pot into the timer so it will turn itself off. First time I made it we all loved it so I’m making it again but this time I brought cream chicken and corn soup. (Really need to take my glasses when shopping now) I hope it will taste ok. I made this for the first time. We loved it. I had thawed a 3 pound package of chicken breasts so I used it all. I added a third can of soup for added sauce. Otherwise, I followed the recipe. Will definitely make again. Can I cook this on high for 4 hours instead? Started it a little late and don’t want to be eating at bedtime. I don’t have 6 hours to make it. Is it okay if I cook it on high for half the time? 4 hours on high should be fine. Can I substitute water for the chicken broth? I don’t currently have any broth. Or could I just forego the broth? Would it just make it thicker, or cause other issues? Thanks! yes, I think that it would work fine! I made this for a potluck, it was tasty! So we add uncooked chicken breast? Or do we cook the chicken then add it? If I want to make this with chicken thighs, how many thighs should I make and is the cook time the same? probably 6 if they are boneless. It will be good with thighs! I have a 2 qt slow cooker. How would you suggest I adjust this recipe? It looks amazing!! Hi Tamika, you could try cutting it in half. That’s a small slow cooker! Just made this. I changed up a few things. I used 1 can cream of mushroom in place of the 2nd can of cream of chicken to take the place of the actual mushrooms. (I can hide them better that way) I used onion powder instead of onion. (Same reason) taste fantastic! The only thing I would change is, i would cube the chicken instead of shredding it. Once you start stirring in all the ingredients, the chicken really disintegrates and I prefer a bit more chuncky. The same as any leftovers. I personally would try to finish it before 3 days. I don’t know if you will get this in time, but I am making this now, I followed ur recipe. The sauce the chicken is cooking in (it’s been 4.5 hrs) has become very runny(watery). It doesn’t look to be this way in your video. Do you have any suggestions? Or is it ok? Thanks!! I think it will all be fine, how did it turn out? 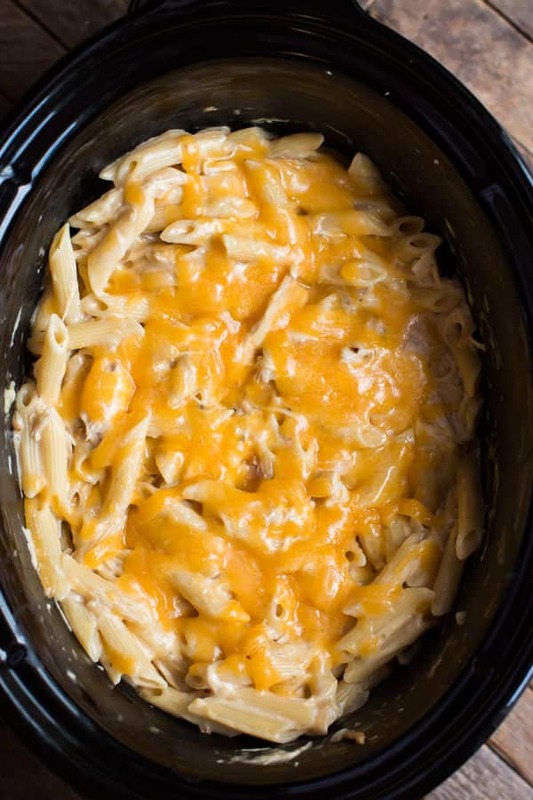 I tried this a couple of months and double the recipe it turned out wonderful let’s just say this the 8 qrt crockpot I have was empty . Thank you so much for the recipe.